Home / Products / Candy / Taffy & Taffy Pops / Creamy Mint Sticks, 1 lb. 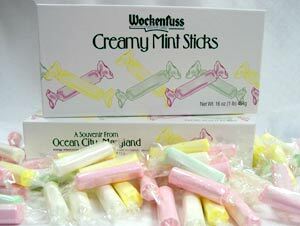 Creamy Mint Sticks, 1 lb. Sugar, Invert Sugar, Hydrogenated Vegetable Fat, Lecithin (an emulsifier), Glycerin, Invertase, Oil of Peppermint, Cream of Tartar and U.S. Certified Food Colors- including FD&C Yellow 5. May contain Wheat, Milk, Peanuts, Tree Nuts, Soybeans and/or Eggs. 1 review for Creamy Mint Sticks, 1 lb. Was given these as a gift – So sorry that we have to wait until May to order but I must say they are worth the wait! Deliciously Wonderful!